Furnaces and hot water heaters should be evaluated for safety and efficiency. As a homeowner, you may have a sense about how well your furnace is working, and can do some routine maintenance, but a thorough evaluation requires technical skills, specific testing equipment and a standardized testing procedure. This work can be done by an auditor who has additional furnace training or possibly a local heating contractor. Before engaging either of these trades, check to see if they have specific training on mobile home equipment and if they have the equipment to perform the tests listed below. As a homeowner, renter or landlord, you should know what type of furnace is installed in the mobile home and have a sense of how the heating system works. First of all, is the furnace an open combustion or sealed combustion type? Older homes often have open combustion furnaces where combustion air, the air necessary for the gas to burn, comes to the furnace through an outside duct, or from room air in the building. In the former case, you can usually find an open duct below the furnace in the crawlspace and a screened hole in the floor next to the furnace. These systems have a gap between the inlet duct and the furnace and a draft hood which can allow flame roll-out, back drafting and high levels of carbon monoxide inside the home. In most cases, the inlet air passes through the combustion chamber and leaves the home through a flue. A much safer type of furnace is called a sealed combustion furnace. In this system, the outside combustion air is ducted directly into the furnace. This inlet duct might be part of the flue assembly or might be a separate duct. All newer mobile homes must use sealed combustion appliances and all replacement furnaces are also sealed combustion. Check out the duct work too. Mobile homes almost always have downdraft furnaces. They pull room air into the top of the furnace, heat it and send the heated air down into the under floor ductwork system. The distribution systems in mobile homes are usually open return air types. In this common system, the heated supply air comes into each room though a floor register. That air returns to the furnace via the hallway adjacent to the furnace. The furnace either has grills on its front and is exposed to the hallway, or is in a closet with two large grills on the door. If there are multiple registers in each room, and there is a large, screened hole in the floor adjacent to the furnace, then you may have a ducted return air system. In this type of ductwork, the cooler returning air typically flows back to the furnace through floor registers, a floor joist cavity and then uses the belly as the return plenum. These duct systems usually have huge leaks and should be converted to an open return system. The “Sealing Ductwork Techniques” fact sheet has details on how to do this. Most of the problems with furnaces need to be addressed by trained technicians. There are, however, a number of things that the homeowner can do to improve the performance of their home. First, check to see that all floor registers are open and that they aren’t covered by rugs or furniture. If they are, you won’t be getting sufficient heat into the areas that need heat and the building and heating system will be unbalanced. We recommend that the dampers in the registers be removed with pliers so that air will flow into the room as intended and the furnace will work efficiently. Similarly, you need to be sure that return air has an open pathway back to the furnace. Every room (such as bedrooms and bathrooms) that has a supply register needs to keep the door open, need grills in the doors or need to be undercut on the bottom such that air can flow back out into the furnace area. It is important to check and replace furnace filters regularly, perhaps as often as once a month in the heating system. 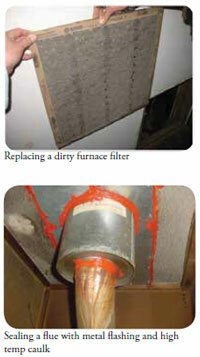 Open up the front panel of the furnace and do a visual check of the filter. If it is covered with dust, vacuum it or replace it. One of the cheapest and easiest ways to save energy is to make sure that you set the thermostat down 10 degrees or so at night or when the house is empty. You can do this manually, or have a programmable thermostat installed. Finally, check the exhaust flue above the furnace where it goes out the ceiling. If you can see a gap between the metal flue and the ceiling paneling, then a metal collar needs to be installed. You can do this yourself. Just make sure you follow correct procedures, maintain the correct clearances and use high temperature materials and caulks. Beyond these measures, a trained auditor or furnace technician needs to evaluate your furnace. That inspection begins with a visual inspection of the flue, the wiring and plumbing connections and of the heat exchanger. The technician should also test for the presence of CO, for combustion efficiency, for temp rise across the heat exchanger, for down drafting, for high limit and for air flow through the duct system. 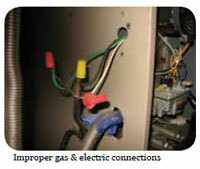 A furnace should be replaced if safety issues are uncovered during testing that can’t be fixed. For instance, if the inspection reveals a cracked heat exchanger, which is fairly common in older furnaces, then the furnace should be replaced. Sometimes an older furnace can’t be repaired because parts aren’t available. Also, if the efficiency of the furnace is very low, then replacement with a high efficiency, sealed combustion furnace may make economic sense. The extra cost will be paid back over time by savings on fuel bills. New furnaces in mobile homes must be HUD approved for mobile homes and must be sealed combustion. The cost of a new furnace, including installation, can vary widely, so check around for prices. Check for tax credits and utility rebates to help pay for the new furnace. The contractor will probably know what is available in your area. Make sure the contractor is experienced with installing mobile home furnaces, and insist that the furnace plenum be sealed to the ductwork with butyl tape and mastic. Hot water heaters should go through a similar evaluation. These heaters are often accessed through an exterior door on the mobile home. First, is the hot water heater electric or gas? Electric heaters are easier to deal with, have fewer safety issues and are often used for replacements. If your water is heated by gas, check to see if the hot water heater is a sealed or open combustion unit. All replacement gas hot water heaters have to be approved for mobile homes and are of the sealed combustion type. Open combustion hot water heaters use outside air to burn the gas and have draft hoods. In certain situations, such as when the dryer is running, these heaters can back draft which pulls carbon monoxide into the room. They must have a dedicated outside air duct for combustion air supply. Sometimes the inlet duct is through the floor, other times the exterior door has grills. The former approach is preferred so that the door can be insulated. A sealed combustion hot water heater has a double concentric flue through the roof. The outer ring of the flue brings outside air into the combustion chamber and the inner flue is for spent combustion gasses. The hot water cabinet is often in need of major repair. It must be sealed to the inside against air leakage so that combustion gasses can’t get into the living areas. That cabinet should also be wrapped and taped with sheetrock to provide a fire barrier, although this is usually very difficult to do because of the tight spaces. Often the floor of the compartment has collapsed from water damage. The heater may have to be removed to rebuild the compartment. While doing this work, make sure that all other holes, such as plumbing chases, openings to bathtubs and wiring holes are plugged. When re-installing the heater, make sure that the installation is up to code. Strap the heater to the walls for earthquake protection. Follow the plumbing code and the electrical code when hooking up gas, water and electrical lines. Older hot water heaters can benefit from wrapping with an insulation blanket. Newer units have better insulation and are labeled against adding additional insulation. While wrapping with insulation, do not cover the gas valve, the combustion air inlet, the PT valve or the top of a gas heater. For future reference, identify the location of electrical junction boxes and heating elements. These procedures are complicated for the novice, but absolutely essential to protect the home occupants.